A young Toronto musician is set to become the first female organist hired at St. Paul's Cathedral in London. After years of playing the organ at Toronto parishes, Rachel Mahon, 24, will begin her one-year stint as an organ scholar at the iconic Anglican church in September. She will play the church's 320-year-old organ for services at the church and accompany and conduct the choir while studying under organist Simon Johnson and sub-organist Timothy Wakerell in the music department. Mahon was chosen from a group of applicants, set apart by a "superbly poised and elegant" audition, St. Paul's Director of Music Andrew Carwood said in a statement on the church's website. "I couldn't believe it. I was extremely excited," Mahon told CTV's Canada AM in a phone interview from her home in Truro, England. Mahon is the first female to hold any organist post at St. Paul's, which is known for hosting the funerals of Winston Churchill and Margaret Thatcher, the wedding of Prince Charles and Lady Diana Spencer and the 80th birthday of Queen Elizabeth II. However, Mahon said that although she's proud to be the first woman, "gender's really irrelevant when it comes to this. I'm just like any other organ scholar." Mahon has a bachelor's degree in music from the University of Toronto, and has played in St. James Cathedral and Timothy Eaton Memorial Church. She switched to organ from piano in 2005, when she was 15, favouring the options the organ's many pipes provided. "You can play something extremely loud and powerful. It could shake the floor (using a) 32-foot pipe, or you can play extremely quietly on a single flute stop," she said. "It's just capable of so much expression, more so than I would say most instruments." Mahon is also one half of Organized Crime, an organ-playing duo that plays traditional and non-traditional music while dressed in stilettos and tuxedos. Mahon and her partner in Crime, Sarah Svendson, hope to bring the instrument to wider and younger audiences. "It would be great to see more girls playing the organ because it is sort of a male-dominated field, especially in the cathedral world, but that's not to say that women aren't welcome," Mahon said. 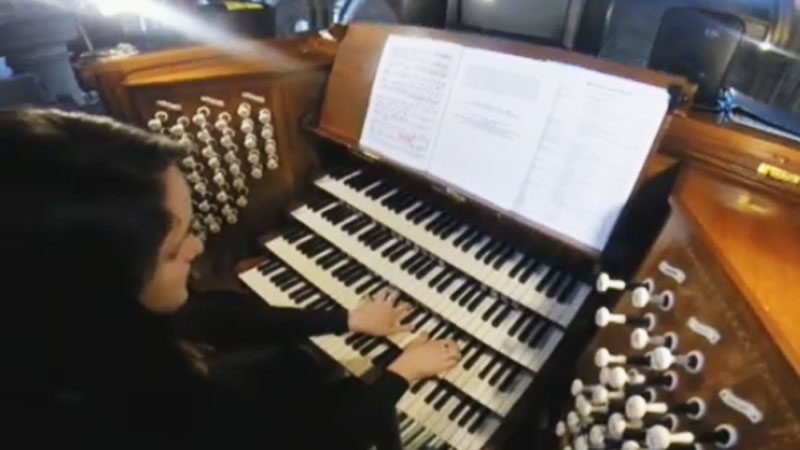 Rachel Mahon is the first female organist hired at St. Paul's Cathedral in London.